We thought it would be a great idea to give whocanihire.com promotional t-shirts away at the annual St. Patrick's Day celebrations and parade in Delray Beach, FL. As a start-up we thought this would be great, ordinarly it is and everybody loves a free t-shirt. We got tremendous exposure for whocanihire and a number of businesses signed up for our service. 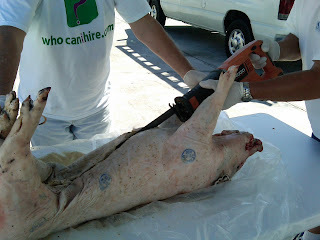 A few weeks later a friend was at a wedding reception/bbq and took the photo below...Yep, that's a pig, a sawzall and a whocanihire.com t-shirt! Maybe I want to hire them for my pig.